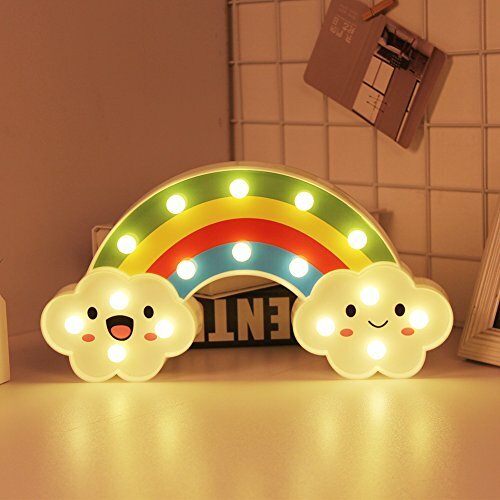 Light Up Your Home with "Cute Rainbow Night Light for Home Decor"
★【Lighting your home】:Light up your home with this rainbow lamp ,add vigor to that bedsides table with this LED night light for home decoration. It offers a warm light ambiance to your place.Add an elegant glow when you put the rainbow in the bedroom,living room,baby room and the so on. ★【Perfect decoration】:This bright tropical light is the ideal eye catching addition to your party table when you place on your mantelpiece or on your table to brighten up your celebrations. Perfect center piece for parties, events and all other year celebrations. Goes very well with all party themes with its eye-catchy retro frame design.It's good choice for your home or holiday decoration. ★【Convenient and saving space】: No more wires, cables or cords to deal with as this is powered through 2pcs AA batteries (not included). Purposely designed with stable feet so you can situate this firmly on a flat surface without any worries. It also has a hole at the back so you can conveniently hang this on your wall or just rest on mantle, shelf, table or dresser. ★【Great gift idea】:Perfect gift for ladies and girls in Christmas, New Year, Valetine's Day, birthday, party, performance,special occasions, etc - Comes in a gift box, ready for gift giving to kids,colleagues, friends and loved ones.